Farm of Croick, Ardgay, nr Inverness, Highland. As a new customer, we started off with a site visit, it was clear that several challenges existed with, range needed, change of terrain, trees and buildings at different elevations. With the Radio Frequency (RF) survey carried out, we identified blackspots and prescribed 2 Momentum Highland LR across the Glen and 3 SR WiFi bridging units and a couple of segrated special Momentum bandwidth controlled long range Access Points to be positioned appropriately to ensure a quality proportioned signal capacity everywhere. Gordon and Robbie from Momentum Solutions Highland have just linked our house, two cottages and lambing shed into a single estate network, linked wirelessly. This allows us to extend the reach of our Satellite-based internet connection to all our properties, cutting out the need for low-quality BT connections. 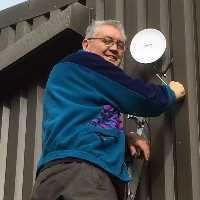 It substantially improves connectivity for staff and visitors on the estate, enables remote monitoring of the lambing shed and will cut out BT costs significantly. The work was done in two days neatly and efficiently, and they went the extra mile to ensure everything worked as it should. And all at a very competitive price. We are delighted.